When we hear the phrase, "the light went on," it's often associated with a moment of recognition. The simple example of entering a dark room and flipping a light switch is an illustration of going from one moment, not being able to see, and the next, with visibility now possible in our surroundings. In hearing today's gospel for the Feast of the Presentation of Jesus, the "light went on" for Simeon and Anna; and not only for them. How did that Light, previously hidden, become so manifest? Both of these figures had been stirred by the Holy Spirit to await something - Some One. 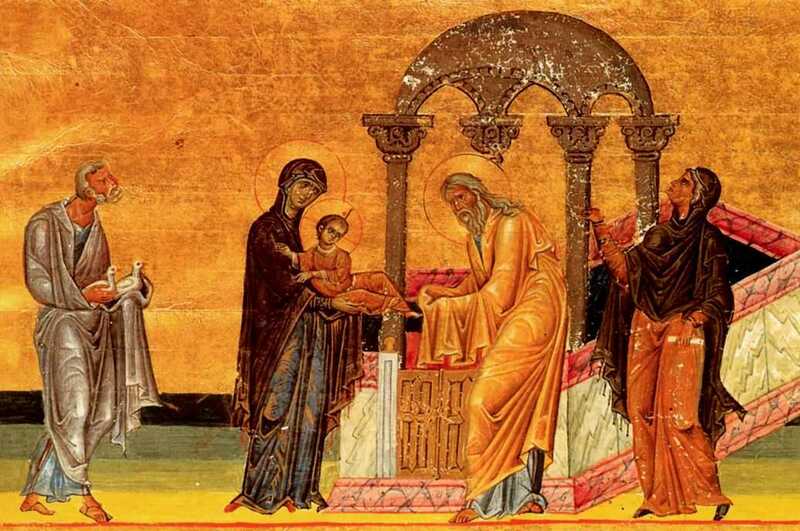 "Prompted by the Holy Spirit, Simeon and Anna came to the Temple. Enlightened by the same Spirit, they recognized the Lord and confessed him with exultation." Simeon's "Nunc Dimittis" gives testimony to his realization of the Messiah's appearance: "My eyes have seen your salvation...a light for revelation...". There is endless food for pondering in his proclamation. A focus struck me today as if a spotlight had shifted to Anna. It was seeing a connection, especially for ourselves as Carmelites, being so present to the hidden; often, not witnessing the fulfillment of waiting in the interior life of prayer, yet persevering because there is a persistent beckoning that is barely perceived. "There was also a prophetess, Anna, the daughter of Phanuel, of the tribe of Asher. She was advanced in years, having lived seven years with her husband after her marriage and then as a widow until she was eighty-four. She never left the temple, but worshiped night and day with fasting and prayer. And coming forward at that very time, she gave thanks to God and spoke about the child to all who were awaiting the redemption of Jerusalem." What an amazing length of time to be at the temple, in fasting and prayer! Additionally, she perseveres to "that very time;" she does not stop short. I think of St. Therese, and others, attesting to the value and importance of every outward expression of light and love to be supported by faithful, loving contemplation. The connection between both comes together uniquely in Anna. When the revealing Light, Jesus, arrives on the scene, a geyser comes to mind. At "that very time," the decades plus of prayerful presence in the temple erupts into thankfulness and proclamation. The Light is recognized by her after this immensely extended preparation, and, even more, that prayer-fueled recognition doesn't stop flowing. In one human being, in one moment, the Light is joyfully recognized and shared, now manifested "to all who were awaiting." (Luke 2). "After Jesus Christ, in the measure in which the finite is distant from the infinite, there is a creature who was the great praise of the glory of the glory of the Blessed Trinity. She corresponded fully to the divine vocation of which the Apostle speaks; she was always 'holy and spotless and unreproved' in the sight of the thrice holy God. Her soul is so simple, its movements are so profound that one cannot comprehend them. ...May she obtain for us in the words of the Apostle that 'Light whose shining is to make known the glory of God as He has revealed in the features of Jesus Christ.' Let is go and beg it of her in the silence of prayer..."